If you work in retail, there’s no doubt you’ve heard about the importance of personalization. A customized experience should apply to all parts of a shopper’s buying journey. But I want to discuss one personalization opportunity that holds many potential benefits for retailers: digital signage. Digital signage presents a big opportunity for retailers. New signage technologies aren’t static images. They can create customized real-time experiences, opportunities for data collection, and a seamless shopping experience. In a recent survey of retailers, restaurants, and other businesses using digital signage, 61 percent of respondents reported this technology improves customer experience. Consider this too: five out of six Americans admit to making impulse purchases when they go to a store. That means when digital signs catch customers’ attention, it’s quite possible they could sway people to make additional purchases. For that to happen, though, these signs need to be used in effective ways. Let’s take a closer look at five digital signage strategies for retail success. Digital signage technology has advanced way past TV screens playing content in a loop. Today’s digital signage takes advantage of data analytics to provide useful information for retailers about who’s looking at signs, but also turns that data into insights informing what content to show a person in real time. This technology uses video analytics to collect anonymous demographic data and interprets it using artificial intelligence. If you’re using digital signage, data is the key to effective, personalized content experiences. Not all offers are relevant to everyone, but with data, digital signage can deliver very targeted content. Digital signage is not one-size-fits-all. Many new, innovative technologies can enhance the in-store experience. Retailers in the clothing industry, for example, might consider using the MemoMi MemoryMirror™, which improves the fitting room experience by remembering what a customer has tried on and showing them images of themselves in each outfit so they can compare. Restaurants, on the other hand, might be interested in dynamic digital menu boards, such as NCR Vitalcast, that speed up the process for menu, offer, and imagery changes. Many retailers have also turned to kiosks, video walls, and other suitable tech that fit the needs of their businesses. Think about your customers and what would make their shopping experience better. While it might seem easiest to place a digital sign where you have space for it, it’s important to be more strategic. As with any display, retailers should carefully consider where it fits not only in the store layout but also the shopper’s journey. To do this, consult the data you’ve collected about demographics and customer movements through your space. Keep in mind a successful message will disrupt the shopping experience in some way, making customers think about a product or offer they probably weren’t thinking about before. In the past, updating content on digital signs and performing maintenance required a lot of time and effort, as employees had to go to the locations of signs to make adjustments. Now retailers can use tools such as Intel® VPro™ technology to manage signs remotely. Using this technology, retailers can see all content from a central location and deploy new content almost instantly. This leads to fewer costly interruptions and better experiences for customers. Digital signage is one piece of the omnichannel retail puzzle, and retailers can benefit from thinking about how it integrates with the rest of their business. How will people who started shopping online connect with the digital content they see in stores? Can your mobile strategy connect with digital signage tactics in some way? Can the data collected from digital signage be used to inform not only in-store adjustments, but also e-commerce changes? If someone is already a registered customer on the company’s website, can a smart fitting room mirror or a kiosk pull up their preferences for them? 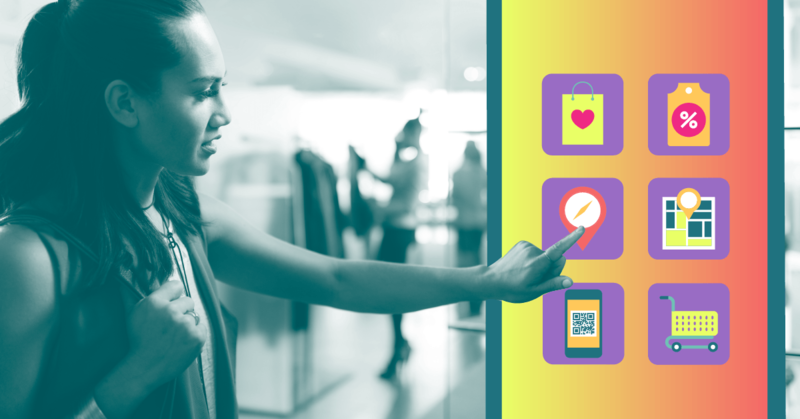 Often, a shopper’s experience has already started before they come through the door, so considering how digital signage can meet them where they’re at — and then inform how the company interacts with them after they leave the store — is important. In-store experiences are changing fast as retailers try to keep up with evolving consumer demands. Experiential retail is becoming the name of the game, and digital signage is a perfect tool for turning a shopping trip into an experience — especially when combined with other intelligent store technologies like the Internet of Things, artificial intelligence, and retail management platforms in the Intel® Responsive Retail Platform. There are many possibilities for digital signage in retail. The more retailers make use of data the better these experiences will be. To learn more about Intel’s digital signage solutions, visit our digital signage center. You can also keep up with retail technology news at the IT Peer Network.